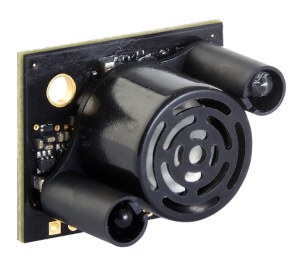 Ultrasonic Snow Depth Sensors | MaxBotix Inc. When winter arrives at our production facilities in Minnesota, we see a lot of snow. Ultrasonic snow depth sensors are a great way to measure just how much snow winter brings. Ultrasonic sensors traditionally struggle to detect snow because it acts like a sound dampener. You can gain further understanding of how snow dampens sounds at this link on Ultrasonic Rangefinder Target Acoustics. At MaxBotix Inc, we produce a range of weather resistant and ultrasonic snow depth sensors that help you successfully overcome the difficulties of detecting soft targets like snow. This article will give you our ultrasonic snow sensor options, talk about proper mounting, and give data from a test we performed ourselves. The reliability and accuracy of a measurement are two main concerns when detecting snow. A true and accurate reading depends upon a range of factors surrounding both the snow and the ultrasonic sensor. This makes it important to find a solution that was designed with snow in mind. This is why we have released reliable, high accuracy, and inexpensive sensors for precision snow depth measurement. The MB7334, MB7344, MB7354, MB7364, MB7374, & MB7384 HRXL‑MaxSonar‑WR Ultrasonic Snow Sensors are an evolution of our HRXL-MaxSonar-WR product line. 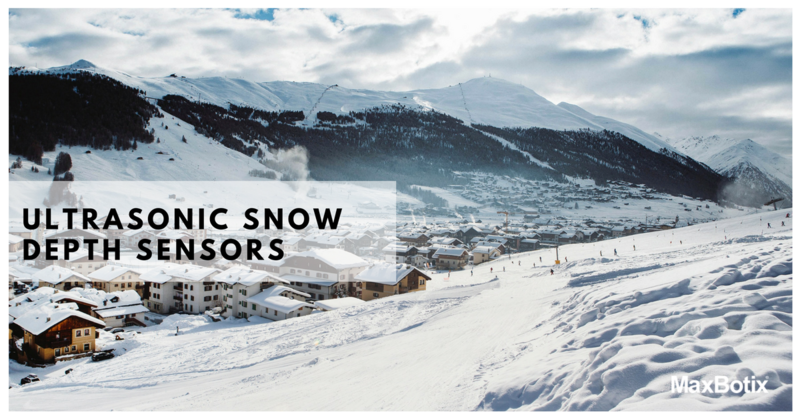 These sensors maintain successful and accurate readings by compensating for temperature, voltage, and target size while maintaining proper sensitivity to detect the density of fresh snow. They were designed with the customer in mind, and we hope they help with your next project. 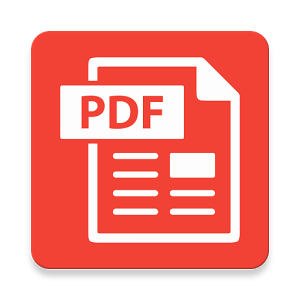 Below is a link to the data sheet for these products. If you still have trouble selecting a sensor, please contact our tech support team at [email protected] or call us at (218)454-0766. We are always happy to help. Once you have your hands on a proper ultrasonic range finder, a final yet extremely important step for snow level measurement is the mounting of the ultrasonic sensor. The height and distance of the sensor from surrounding obstacles is a key point in mounting the rangefinder. This includes where and how you measure the temperature for proper range compensation. Because of the high gain of the sensor, it is important to mount the sensor far enough away from any supporting masts or towers. 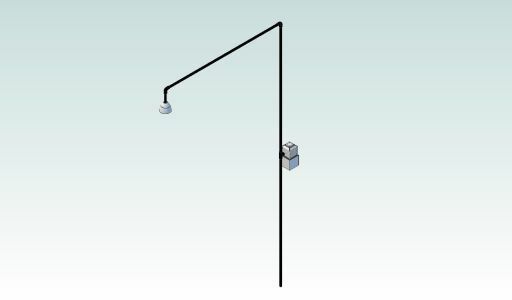 For a mast that is 5 meters high (or higher), the sensor should be mounted at least 100 cm away from the mast. For a mast that is 2.5 meters high (or lower), the sensor should be at least 75 cm away from the mast. (This corresponds to a mounting clearance angle of 11.3 degrees). For users desiring the highest accuracy, using a properly mounted external temperature sensor is recommended. The shroud component is assembled over the top of the HRXL‑MaxSonar‑WRS sensor housing. This shroud is a UV shield for the sensor. The shroud also acts to protect the sensor from heavy snow buildup. Reference figure 1. The second component is a louver design housing to protect the temperature sensor from direct and reflective UV rays. This housing has been created to maintain a real-time accurate temperature. This component is separate from the shroud that covers the HRXL-MaxSonar-WRS. Reference figure 2. The third component is a fan housing which is able to hold either an AC or DC cooling fan under the temperature housing. 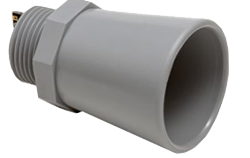 This has been created for maximum airflow to the temperature sensor housing. The fan housing helps to ensure the temperature sensor is the same temperature as the surrounding environment. Reference figure 3. In this configuration, it is recommended that the temperature sensor housing is mounted on the mast. 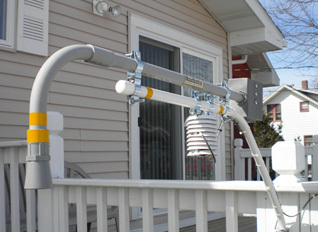 Figure 4 below shows a rendering of the ultrasonic snow depth sensor when operating on a mast with a height of 5 meters. We tested both the MB7334 and the MB7354, and we found they will produce great results for most snow depth measurements. The accuracy was measured over 5 days on three million continuous readings with ultrasonic snow depth sensor data presented here. The graph below shows the outputs from three of our ultrasonic sensors. 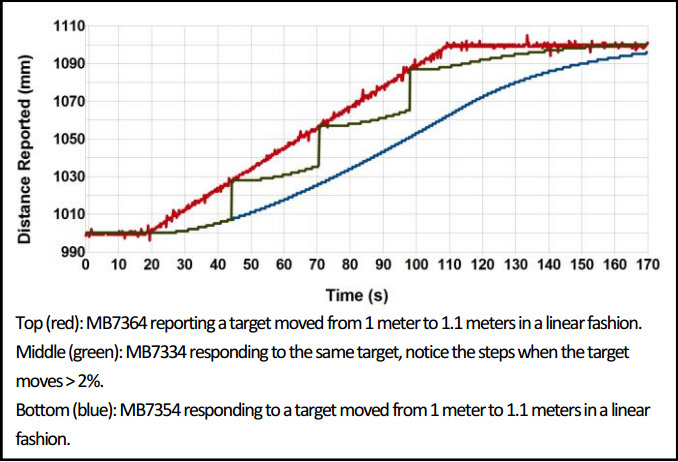 These sensors filter the outputs and the graph shows what happens when a target is moved 10 cm over a 90 second time period. Snow doesn’t come down that fast, so the sensors don’t need to respond that quickly so MaxBotix designed ultrasonic sensors to specifically make snow sensing much more reliable. The following ultrasonic rangefinder sensors will give you the results you expect for all your snow measurement applications. Features of the weather resistant MB7364, HRXL-MaxSonar-WRS, include millimeter resolution, range information from 500mm to 5000mm for the nearest detectable target, heightened sensitivity over our standard sensors, a 6Hz read rate, and various output options: pulse-width, analog voltage, and RS232 serial. Features of the weather resistant MB7384, HRXL-MaxSonar-WRST, include millimeter resolution, range information from 500mm to 5000mm for the nearest detectable target, heightened sensitivity over our standard sensors, a 6Hz read rate, and various output options: pulse-width, analog voltage, and TTL serial. Features of the weather resistant MB7334, HRXL-MaxSonar-WRS3, include millimeter resolution, range information from 500mm to 5000mm for the nearest detectable target, heightened sensitivity over our standard sensors, a 6Hz read rate, and various output options: pulse-width, analog voltage, and RS232 serial. Features of the weather resistant MB7344, HRXL-MaxSonar-WRST4, include millimeter resolution, range information from 500mm to 5000mm for the nearest detectable target, heightened sensitivity over our standard sensors, a 6Hz read rate, and various output options: pulse-width, analog voltage, and TTL serial. Features of the weather resistant MB7354, HRXL-MaxSonar-WRS5, include millimeter resolution, range information from 500mm to 5000mm for the nearest detectable target, heightened sensitivity over our standard sensors, a 6Hz read rate, and various output options: pulse-width, analog voltage, and RS232 serial. Features of the weather resistant MB7374, HRXL-MaxSonar-WRST7, include millimeter resolution, range information from 500mm to 5000mm for the nearest detectable target, heightened sensitivity over our standard sensors, a 6Hz read rate, and various output options: pulse-width, analog voltage, and TTL serial.